3DS Ambassadors late last month received ten Game Boy Advance games for purchasing the 3DS before a set date. The following game is but one of these ten games, Mario Kart: Super Circuit. Here is my review. Off to the Races-- Portable-Style! Mario Kart 7 recently released onto the Nintendo 3DS and brought with it 32 tracks total, 16 new, 16 old. 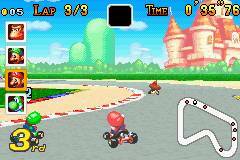 Before Mario Kart: Super Circuit, the concept of putting a Mario Kart game on a portable was unheard of. That was until the Game Boy Advance iteration of Mario Kart came to the system and blew people's expectations away. Both Mario Kart 7 and Mario Kart DS have Super Circuit to thank for giving a hand-held Mario Kart game a chance. Somehow the developer of Mario Kart: Super Circuit, Intelligent Systems, managed to recreate the MK experience from the big screen and transplant it to the small screen in the form of Mario Kart: Super Circuit. Does this title burn rubber, or is it in dire need of a pit stop? Right away when you pop in Super Circuit you will notice a flurry of options available. 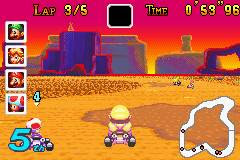 You can pick from the Grand Prix which has three difficulties in the form of 50cc, 100cc, and 150cc, Time Trial where racers ride for their best times on the various tracks and courses the game has to offer, and Quick Run which puts players in a race against the computer, with or without items, with or without coins, and on a track of their choosing. 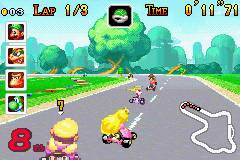 With the Game Boy Advance's link cable and multiple systems, players can race against one another, trade ghosts in Time Trial mode, and duke it out in one of many battle arenas in Battle Mode. Unfortunately, finding someone with a Game Boy Advance, a copy of the game, and a link cable is easier said than done, especially in 2012. Mario Kart returns, but this time it's gone portable! Unlike past Mario Kart games, there are actually five unique cups to choose from in Super Circuit instead of the usual four. There's the Mushroom Cup, Flower Cup, Lightning Cup (this is the new one), Star Cup, and Special Cup that unlocks after the previous four cups have been won. As a bonus, once players have completed a given cup in first place, they can return to that cup and try to earn at least 100 coins across all four races (each cup is comprised of four races) to unlock a series of tracks from Super Mario Kart. There are five retro tracks in all made up of twenty tracks, giving Mario Kart: Super Circuit the most tracks the series has ever seen. This is a record that still has not been beaten. 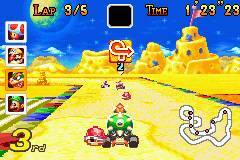 Races in Mario Kart: Super Circuit all take place in a Mode 7 setting. Backgrounds revolve around when you make a turn, and they are busy with animations such as a giant Cheep Cheep leaping into the air or a myriad of tubes filled with lava all pulsating in unison. Meanwhile, other backgrounds of tracks are impressive even without having any movement in them such as Boo Lake's ominous haunted houses, Lakeside Pier's volatile volcanoes, and Mario Circuit's fabled Peach's Castle resting among the colorful scenery. In the foreground there are special effects such as rain falling in Luigi Circuit, for instance. Furthermore, even though you are playing in a 3D space, the characters, objects, and items that litter the track are all 2D in design. 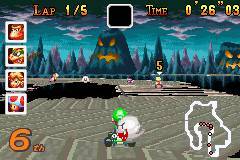 Moving along to the sound, Mario Kart's cast of kooky characters (eight in all-- Mario, Luigi, Peach, Yoshi, Toad, Wario, Donkey Kong, and Bowser) all have various voice samples such as when you hit another racer with a shell, your character will taunt in victory. Additionally, the soundtrack is full of happy-go-lucky tunes that are standard fare when it comes to the Mario Kart series. You won't necessarily be blown away, but you might find yourself bopping your head to a tune or two. Mushroom Kingdom traffic is always a nightmare. Along with the twenty unlockable Super Mario Kart tracks available there are twenty brand-new tracks to race on. You'll be zipping along beaches infested with sidestepping crabs while avoiding being pelted by cannonballs being launched from a ship in the distance, you'll be weaving through Thwomps and Mechakoopas in one of four versions of Bowser Castle, and you'll be swerving and launching yourself over parts of the track in a colony made up entirely of cheese. Lactose intolerant racers need not apply for the latter. Whether you're racing along Ribbon Road, dodging falling shooting stars that will spin you out upon contact on Rainbow Road, or narrowly escaping sinkholes where hungry Piranha Plants want their lunch in Yoshi Desert, the course design is always top-notch and interesting-- at least far more enjoyable in comparison to SMK's tracks. There also just so happens to be plenty of shortcuts to discover when speeding through the twenty tracks, too. Moreover, while racing you will see signs pop up indicating what kind of turn is fast approaching such as hairpin turns, right or left turns, and U-turns. So now that we've decided that the tracks are stellar, how is the actual racing? Well, it takes some getting used to, and even with enough practice and hours logged into the game, I feel that the controls are simply way too slippery for my taste. Executing power-slides and mini turbos is needlessly complicated, requiring you to be in a power-slide for at least a couple of seconds before you can jostle the control pad back and forth to start the boost. The slippery feeling of the controls aside, I found myself easing off the accelerator on turns when I couldn't count on drifting through them (you end up making a really wide turn otherwise). Of course, it wouldn't be Mario Kart without items to spice things up. This tradition continues with Super Circuit. The mainstays from Mario Kart 64 all make their return such as banana peels that will slip up whoever rides over them, invincibility stars, lightning bolts, green shells, as well as homing red shells that this time around can be shot from behind, but instead of just launching back with momentum, they stop, waiting for the first unfortunate soul to pass them and then home in on their victim. Unlike every other game in the series, items that home in on you give you a second or two to allow you a chance to deflect them before they zero in and attack. This makes for an easier, less frustrating go of it. steal your coins, and de-friend you on Facebook! Returning from Super Mario Kart and what would be seen in Mario Kart 7 are coins. They are strewn in groups and individually all across the various tracks, just waiting to be picked up. To my knowledge there is no maximum amount that you can carry, so grab as many as possible to increase your speed. Every time you bump into another kart, you lose a coin. Bump into a kart without any coins in your possession and you spin out. At the end of each cup you are given a rank-- either a letter grade or one, two, or three stars-- based on how fast you sped through each race and how many coins you collected. For ultimate longevity, players should attempt getting three stars in every cup in every cc. their reappearance in Super Circuit. Mario Kart: Super Circuit is certainly a less aggravating kart experience when compared to future installments in the series, but it also lacks the tight controls said installments, too. This makes for slippery controls that do not feel quite right. Regardless, when you factor in that this game has forty tracks total (half new, half from Super Mario Kart) and lots of replay value, you really can't go wrong in racing to pick up this game or-- if you're a 3DS Ambassador-- downloading this game now. While not coming across the finish line with a record time, Mario Kart: Super Circuit still manages to complete the race by a close margin. Excellent review. 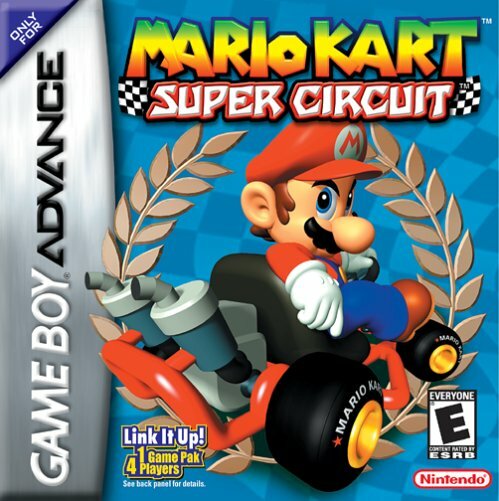 Mario Kart: Super Circuit was my first GBA game and I played it to death. I really do need to play it again. Welcome to SuperPhillip Central, Reggie! Thanks for the nice words about my review. Since you're new, you might as well know that I don't proofread these things (a fact older readers know all too well), so if you find a mistake, let me know! The GBA title was a great portable Mario Kart game, but compared to 7, it is a little hard to get back into. The DS one became my default favorite, though 7 is getting pretty darn close in beating that. Words cannot describe how much I love this game - I actually much, much prefer it to 7.